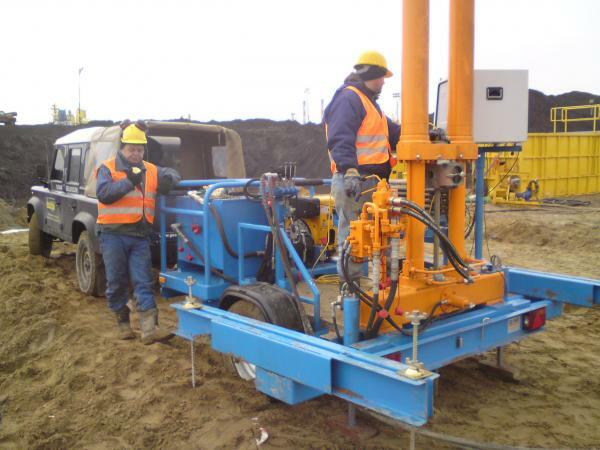 The penetrometer 200 kN/TR manufactured by Dutch company GEOMIL is designed for geotechnical static penetration tests. Cone penetration test consists in vertical pushing the rods with special cone tip into the ground at constant rate of 2,0 cm/s ± 5mm/s. Penetrometer together with accessories is mounted on uniaxial trailer. Penetrometer is powered by compression – ignition engine 1D 81 C. Equipment is anchored to the ground with the use of disk bits. Penetrometer is provided with measuring – recording device GME500 IP65 which records parameters measured during the test. It has to be mentioned that the described equipment is brand new as it was manufactured in 2009. The most important technical specifications of CPTU are presented in the table below. New measurement device has producer certificate however, according to PN-B-04452:2002 standard it is sent for re-calibration after each 3 000 m of sounding but not less often than once each six months. Condition of the cone and its correct dimensions (see Table 1) are checked each time before test. Before test filter and empty spaces are de-aerated and filled with fluid (e.g. hydraulic oil). Before pushing cone into soil the recording device executes automatic calibration and determine „zero” of the measurement equipment. Identical procedure is repeated after test. These measurements allow to obtain measuring error, which should not exceed 5%. Inclination of rods is controlled during the test and it should not be bigger than 2%. Data recording and graphic presentation of test results is made with the use of GEOMIL software: CPTest and CPTask. Interpretation of test result is executed according to binding standards with the use of new software for CPT test interpretation CPT Star produced by Sof-Projekt company. This software enable for efficient elaboration of test results, calculation of soil parameters as well as graphic edition of test’s card. CPTask and CPT Star also enable data export to excel files. Super heavy dynamic penetrometer DPSH made by Swedish company BORRO AB is designed for vertical geological sounding in order to obtain relative density ID of non-cohesive soils. 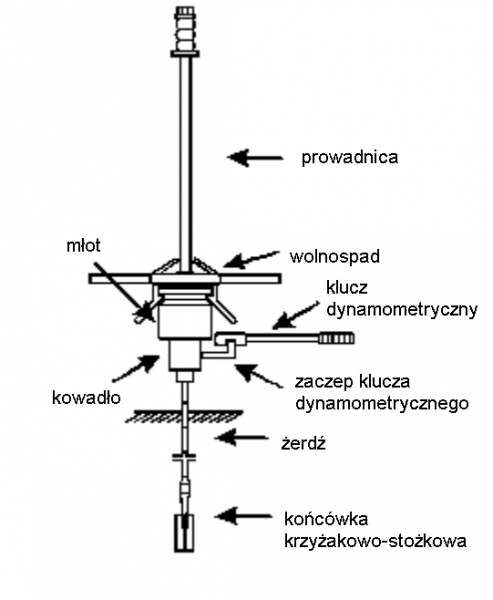 Test consists in measuring soil resistance to penetration by penetrometer’s cone tip. Penetrometer is equipped with a „loosing” cone. It is powered by combustion engine HONDA. ID = 0,441 log N20 + 0,196. Technical specifications of DPSH penetrometer is presented in table below. Parameters like hammer weight or drop height correspond with parameters of the oldest, standard penetrometer used in geotechnical investigation i.e. Standard Penetration Test. Drop height should be checked before testing, because equipment can be reset for so called Swedish standard (50 cm). The rods with cone tip are vertically driven into the soil in a constant way. Frequency of blows is kept within limits from 15 to 30 blows/min. (20 according to producer’s instruction). A 1,5x rotation of rods around their axis is made each 1 m of probing in order to decrease skin friction of the rods. Dynamic penetrometer DPL/DPM manufactured by Nordmeyer company is designed for vertical geological sounding in order to obtain relative density ID of non-cohesive soils. Test consists in measuring soil resistance to penetration by penetrometer’s cone tip. DPM penetration test is executed with the same equipment as DPL after changing the rods and adding a bob of 20 kg weight. Technical specifications of DPL and DPM penetrometer is presented in table below. The rods with cone tip are vertically driven into the soil in a constant way. Frequency of blows is kept within limits from 15 to 30 blows/min. (20 according to producer’s instruction). A 1,5x rotation of rods around their axis is made each 1 m of probing in order to decrease skin friction of the rods. Dynamic-vane probe SLVT (Fig 1) is designed for soil penetration, mostly for weak soil testing such as firm and soft cohesive soils or organic soils and establishing their mechanical properties. 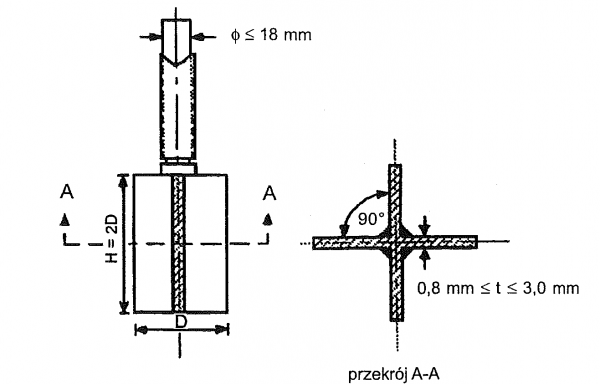 Test is combination of dynamic penetration DPL with the possibility of undrained shear strength τfu measurement through recording the torque of cross tip (Fig 2) using the torque wrench. 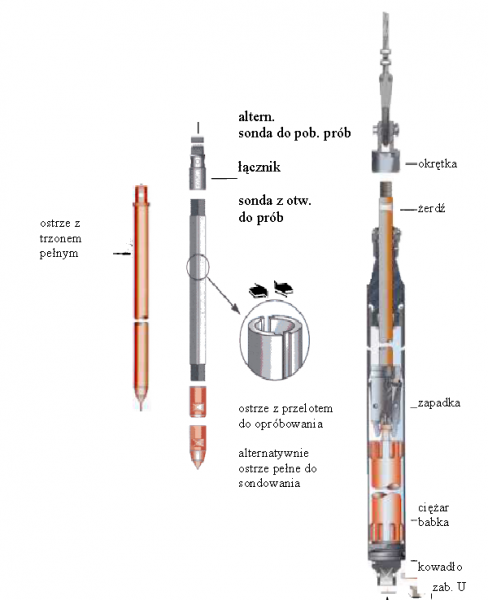 Company has also an older type of such a probe: ITB-ZW. 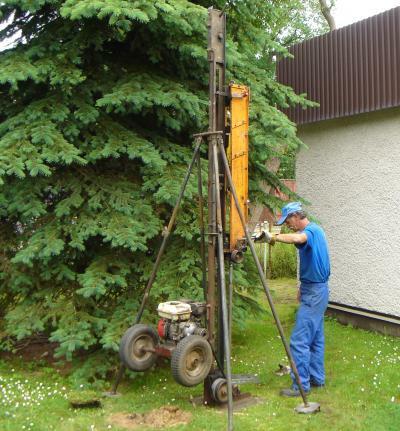 Test consists in measuring soil resistance to penetration by penetrometer’s tip into a bottom of the borehole and identification of soil on the basis of taken samples. The SPT penetration test is executed with the use of 63,5 kg hammer. The drop height is 760 mm. The soil resistance is measured as the number of blows (N) needed to penetrate the soil to the depth of 300 mm (after initial 150 mm penetration caused by dead weight of device and initial penetration). The penetrometer may be ended by a cylinder with a cutting shoe to take samples during the test or by a cone which assures reliable results when coarse grained soils are tested. The old type of SPT penetrometr were lowered into a borehole on rods with anvil on the top. Recently (BDP version bought by „Geoprojekt Szczecin” in 2010) is lowered down the hole on a wire, which reduces remarkably the total weight of the set, as drilling rods are not used. Watertight lining of hammer and releasing mechanism plus additional load against buoyancy when water column is high (>20m) assure a proper way of testing also below the ground water level. The old type of SPT penetrometr were lowered into a borehole on rods with anvil on the top. Recently (BDP version bought by „Geoprojekt Szczecin” in 2010) is lowered down the hole on a wire, which reduces remarkably the total weight of the set, as drilling rods are not used. Watertight lining of hammer and releasing mechanism plus additional load against buoyancy when water column is high (>20m) assure a proper way of testing also below the ground water level.